Visit kellenberg.formed.org to register for free today. 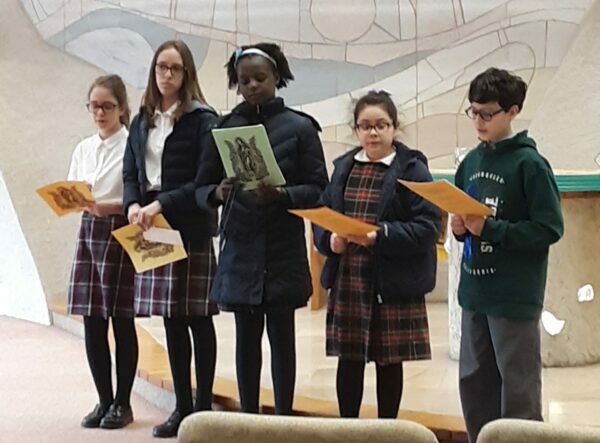 The Kellenberg Memorial experience is primarily a faith experience in the context of a school community. The religious life of the school centers around the ARK. The ARK is our campus ministry center. The word ARK stands for Apostolic Response at Kellenberg. Known for its spiral staircase, the ARK is home for our religious activities and serves as the place that organizes the faith life of our school. Daily Mass is offered before the beginning of the school day at 7:20 a.m. in Maria Regina – Chapel of Our Lady. All the members of the Kellenberg Memorial family may attend--students, parents, family members, faculty and staff. The school day begins with a short prayer video in homeroom which is broadcast over the school television system. The spirit of prayer continues through the entire day with prayer before each class, with the daily recitation of the Angelus at noon (during the Easter Season, the Regina Coeli) and with our final prayer, the "Three O’Clock Prayer," at the end of the day. Students have the opportunity to attend the Midday Prayer Service which is held before each of the lunch periods. Led by Seniors, this short service provides time to slow down and experience God as a daily routine in the school day. On the Feast of The Triumph of the Cross, the year spiritually begins when the entire school gathers outside near the cross for an opening Prayer Service. The Feast of The Triumph of the Cross is a focal moment at Kellenberg Memorial, a time where we recall the power of God's love for us and his triumph over sin and death. Each month the entire school comes together for the celebration of the Eucharist. Three Masses are celebrated simultaneously in the auditorium, gymnasium and cafeteria. The Sacrament of Reconciliation is held annually for the entire student body and also available at any time from one of the priests on the staff. Special emphasis is given to the liturgical seasons of Advent, Lent and Easter. One major focal point at these times is the school-wide Prayer Service which is presented by the Kellenberg Memorial students. Each year the Kellenberg Memorial Family gathers for an annual communion breakfast. Mass is celebrated in the auditorium followed by breakfast in the cafeteria. There are two communion breakfasts, one for the 6th, 7th, 8th and 9th grades on the Fifth Sunday of Lent, and the other for the 10th, 11th and 12th grades on Palm Sunday. The Christmas Midnight Mass is celebrated each year in the auditorium for the Kellenberg Memorial Family. The celebration begins at 11:30 p.m. with traditional Christmas carols sung by the chorus. As a Marianist school, particular emphasis is given to Mary as Mother of God. The Rosary Prayer Service is held in conjunction with the Feast of Our Lady of the Rosary. In addition, each May we crown Mary our Mother in the presence of our entire school community. Throughout the course of the year, other Marian feasts are highlighted. Students are encouraged to become involved in the many religious and service activities which are conducted in school. Students are invited to join in the prayer of the Universal Church before each lunch period. Midday prayer is recited in the Maria Regina student chapel. Faith Fridays are held throughout the school year by division. The Theme of Faith Friday is building relationships through a Community of Faith. These spiritual events are planned on the school calendar on Fridays throughout the year. 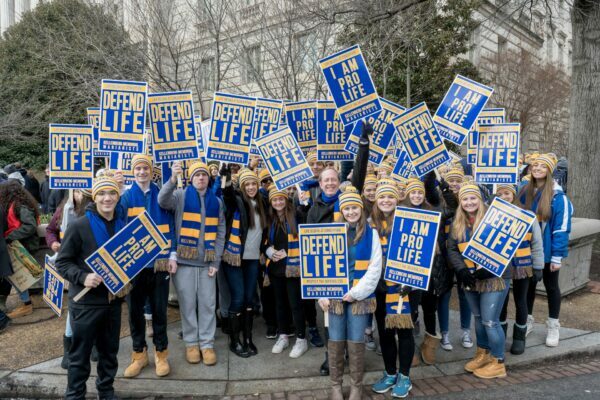 Diocese of Rockville Centre Bishop John O. Barres with Kellenberg Memorial students at the March for Life in Washington, D.C. The Sixth Grade Retreat takes place at the Shrine of Our Lady of the Island in Eastport. This day retreat focuses on the basic devotional elements of our faith including a spiritual journey of Jesus’ suffering using life-size Stations of the Cross. The Seventh Grade Retreat is a full day retreat that focuses on the Sacrament of Confirmation and the significance of what it means to be a young Catholic in the faith. In preparing for their final Sacrament of Initiation, the students engage themselves in discussions led by the Junior Retreat Staff about the formation of their faith life and how they look to utilize the gifts and fruits of the Holy Spirit. By day’s end, the students discover how to become “defenders of the faith” by learning about the impact of cyber bullying during their middle school years. The full-day retreat for the Eighth Grade students focuses on learning service through the corporal and spiritual works of mercy. The call of every Catholic is to be Jesus Christ to others. Through our baptismal call, our relationship with God the Father, our commitment to Jesus and the indwelling of the Holy Spirit, our mission as Jesus’ disciples is to go out, to spread the Good News of Christ, and to work to alleviate the pain and suffering of others. Through discussions with the Junior Retreat Staff, skits, and active participation in Mass, students make the works of mercy applicable to their daily life and challenge them to continue to live out their faith in both word and deed. Starting in the Second Trimester, the Freshman class is divided by young men and young women for their retreat experience. The Freshman men spend their day focused on what it means to be a Catholic man, while the Freshman women focus on what it means to be a Catholic woman. Each retreat is meant to instruct the men and women on how to live their lives as children of God. These retreats are run with the assistance of members of the Junior Retreat Staff. 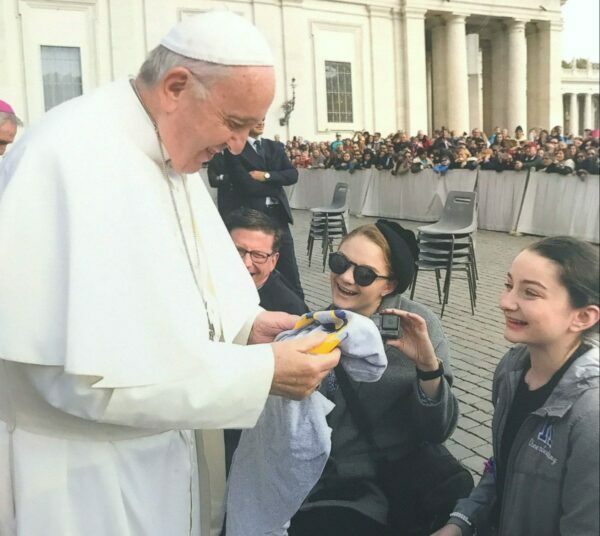 Through challenging discussions, presentations from moderators, and visits with religious brothers and sisters, the Freshman are challenged to continue to grow in their relationship with Him with the help of divine grace. 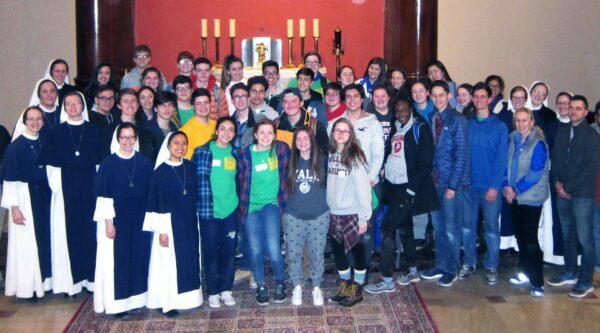 At the beginning of the year, Sophomores attend a full day retreat in Emmanuel. The program focuses on the discovery and the development of the spiritual life for teens. Discussions and presentations cover themes that deal with self-esteem, contrasting the values of Jesus with the values of the world and developing a personal relationship with Jesus. Members of the SAINTS Program assist with this retreat. The Junior retreat is a full two day, overnight program with an emphasis on "Self Knowledge through Community," using themes from the junior religion course, Christian Morality. The Junior Retreat is a community experience where the students prepare common meals, share in discussions, participate in common recreation in an attempt to form a Christian Community of one heart and one mind. Celebration of the Eucharist, prayer services, Exposition of the Blessed Sacrament, time for quiet prayer and opportunities for the Sacrament of Reconciliation emphasize the fact that faith flourishes in community. The Senior Retreat is also a full two day, overnight program that focuses on the challenges that the Seniors are meeting as they go through the personal transition that soon leads to college. The highlight in the evening is a Eucharistic Adoration Candle Prayer Service which focuses on spiritual needs including hope, honesty, courage, truth, and the Blessed Virgin Mary. Each season, every high school sports team has the opportunity to attend a team retreat. The retreats seek to answer the question: “How can athletics give glory to God?” Through the reflection on scriptures and the personal witness stories of professional athletes, the team comes to a better understanding on how God can be found on the athletic field and how the skills learned can help their spiritual life. The retreat experience is communal in nature, focused on team building activities, a meal and a prayer. The Varsity level retreats are held in the evening after practice, whereas the JV and Freshman level retreats are held in the afternoon. This 200-acre plot of scenic property in upstate New York was acquired by the Province of Meribah to augment apostolic and retreat work. Founder’s Hollow is named in honor of Father William Joseph Chaminade, founder of the Society of Mary, who was beatified by Pope John II on September 32 3, 2000 in Rome, Italy. Various activities and athletic teams may use the facility for retreats, workshops, work weekends, seminars and training programs of an educational nature. All activities at Founder’s Hollow are coordinated by the Director of Founder’s Hollow. The ARK sponsors First Friday Adoration of the Blessed Sacrament during the school day in the Maria Regina Chapel. All members of the Kellenberg Memorial Family are welcome to attend. The Eucharistic Ministers will sponsor a prayer experience to begin Adoration during each period of the school day. XLT (Exalt) is an intense worship experience centered around Adoration of the Blessed Sacrament. On one Wednesday evening a month, students are invited to join their classmates and faculty for dinner, a presentation by a notable speaker and prayer. To foster awareness of our baptismal commitment to live as a Christian. To develop a greater sense of Christian community in each individual Sodality group. Jesus founded a community and it is the goal of Sodality to make each member realize the strengths that come from being in and praying with others. To acquire a deeper knowledge of Jesus and Mary by discussing and praying the Scriptures. To reflect on serious faith and moral issues which touch the lives of a young person today. Weekly Sodality Meetings are held every Monday beginning at 3:00 p.m. and concluding at 3:30 p.m. This time is considered so valuable that no other school activities are scheduled at this time. Students are encouraged to participate in retreats, religious activities and community volunteer programs. Because no other activity meets during Sodality, participation is not listed as a school activity. All students enrolled in grades nine through twelve are eligible for joining Sodality. The Sodality groups are faith evolving groups, where the individual can grow spiritually with the same Faculty Moderator and group each year. The Sodality groups are organized according to division by the Directors of Sodality.